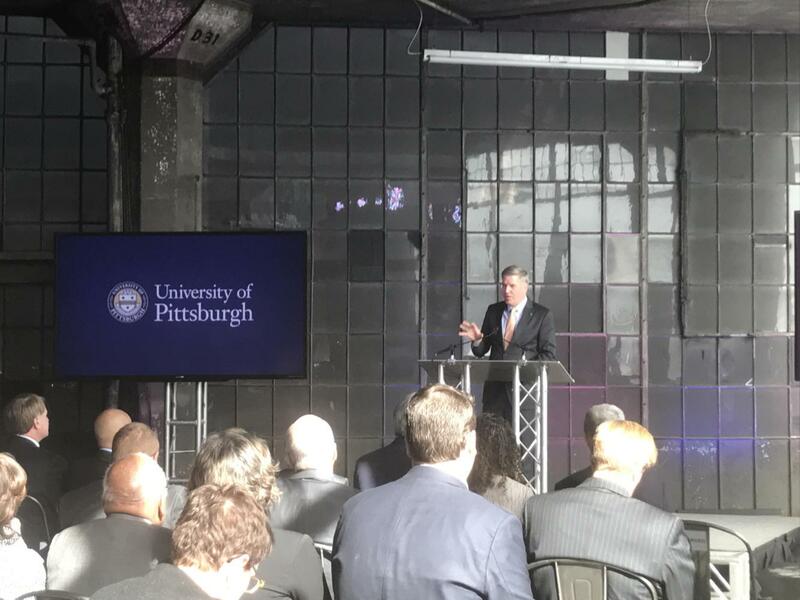 Jeffrey Romoff, president of the University of Pittsburgh Medical Center, walked on stage at a century-old abandoned car factory Tuesday afternoon and wondered where some of its necessary facilities were. The investment will build the UPMC Immune Transplant and Therapy Center in Bloomfield in a 200,000-square-foot building that Ford built in 1915. The center will house start-ups, labs and offices, focused on researching treatments and drugs that target autoimmune diseases, cancer and aging. Nonprofit and government leaders, including Chancellor Patrick Gallagher, Mayor Bill Peduto and Romoff, spoke at the announcement. Gallagher said the center will create an “unprecedented ecosystem” that would connect researchers from Pitt and UMPC to industry partners. “It’s a combination that will transform immunotherapy care and help us tackle some of medicine’s greatest challenges,” he said in a statement. The center is part of Pittsburgh’s “Innovation District,” a city-wide partnership based on a Brookings Institute report that said the city can better capitalize on life science expertise. The center is expected to take two years to complete and “create thousands of local jobs,” according to a CPMC release. Gallagher said at the press conference that the renovation of the building is expected to take at least two years. The hub itself is expected to create at least 2,000 local jobs, support a stronger regional economy and attract an “ecosystem” of professionals and businesses. He also said the building would provide a place that “sparks” creativity between different groups of people, in this case medical experts, University researchers and entrepreneurs. “That spark is interaction and collaboration, smart people sharing ideas, working together and challenging each other to achieve breakthroughs,” he said. Aside from stressing UPMC’s partnership with Pitt will help find ways to cure disease and develop therapies, Romoff touched on the potential economic benefits it will bring to the region. He said the creation of the hub will ensure that medical talent and innovation stay in the city. Rebecca Bagley, Pitt’s vice chancellor for economic partnership, cited the Brookings report in her speech at the Ford building. She said her office conducted a life sciences analysis funded by the Hillman Foundation and RK Mellon and found they needed to think more “holistically” and connect different parts of the city and different sorts of innovators. “This building becomes a critical part of that ecosystem because as we talked about that proximity and people being able to work side by side it really generates more translation and brings more ideas into the marketplace,” she said. Gallagher also brought up the possibility of Amazon bringing its second headquarters to Pittsburgh during his speech — but said the Brookings report had determined Pittsburgh could do fine without it. “The Brookings report noted that Pittsburgh’s innovation strength is so strong that if we just did an average job connecting our economic activities to that potential we would create more jobs than we’re talking about with the Amazon Headquarters,” he said. Peduto said he had a history with the 5000 Baum Boulevard building since he had worked there with community groups during his time as a city councilman. Peduto said research and development in technology and medicine will create a new future for the region and connect the entire City from Hazelwood to Lawrenceville, starting at the “fulcrum point” the building serves as. In an interview after the announcement, Bagley said the hub will impact University faculty by allowing more knowledge to be transferred across disciplines. It will benefit students by giving them more internship opportunities through companies attracted by the hub and connecting them with experts in certain fields in the classroom. Gallagher said in an interview that the hub will attract some of the “best scientists in the world” who will also serve as professors for students. He also said some of the companies who end up collaborating with researchers in the hub could be Pitt student startups. “We’re talking about an entrepreneurial economy, this is place where you could start your own company and take that chance,” he said. Gallagher said during the conference that in his view, the creation of the hub plays into the broader story of Pittsburgh as an “innovation city,” citing the metals and electric industries as having led to enormous industrial commercial activity in the past. He remarked on how 5000 Baum Boulevard was a center of innovation for the budding automotive industry in the early 20th century. “And maybe a century from now people will say, ‘it’s hard to imagine what life would be like without the groundbreaking work that took place at 5000 Baum,” he said.